When Rowan receives his grandfather’s toy fire truck, he learns to see beauty—and adventure—in the old. It’s Rowan’s birthday, and the red-haired white boy knows exactly which fire truck he wants. From the store window it beckons, with larger-than-life features and dazzling red paint. But instead, he gets Papa’s rusty old truck. Disappointment and tears brew, but it’s apparent Papa loves the old toy, and as he repairs Red, he recounts their daring deeds. A skeptical Rowan politely listens, until the stories become so interesting, so real, they fill the page, and Rowan is swept up in them, becoming part of Red’s history, seeing Red’s possibilities. Even before the fresh paint dries, Rowan realizes the beauty of Red—and of Papa. Staake’s signature style is as appealing as ever, but it’s his brilliant use of contrasting styles that gives Red its soul. 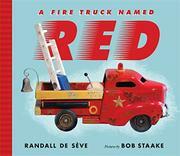 Here, the new, modern toys are rendered in his typical, flat style, whereas Red is depicted with photorealism and loaded with texture, giving the old fire truck life, character, and depth. Papa’s memories of Red are done in an evocative sepia tone. As the adventures become more engrossing, Rowan is literally pulled into them until he is fully immersed, deepening his bond to his Papa.